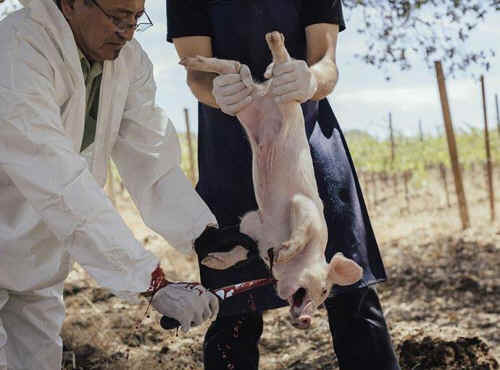 The picture is from the “Death for Food” website and is an actual photo of the type of event scheduled for Nov. 23 at Suzie’s Farm in San Diego. Any comments you write on the petition will automatically be sent to Suzie's Farm, an organic vegetable farm in San Diego that ordinarily supports animal protection and should not be celebrating slaughter. On Sunday, November 23 our farm will be the location for a very unique, educational, and thought-provoking dinner. Local photographer and food advocate, Jaime Fritsch, is bringing his Death For Food series to Suzie’s Farm after his initial event at Javier Plascencia’s Finca Altozano in Baja back in July. Killing animals is exactly what is wrong with our food system on so many levels (ethical, health and environmental). It is not something that should be celebrated or people be made more “connected to,” especially at a farm that prides itself in providing what our food system needs more of: local, organic vegetables. I come from a family of dairy farmers displaced by corporate mega-farms a generation ago. However, there is nothing better or more romantic about small family farms when it comes to what happens to the animals. I haven’t consumed dairy—or any animal products—in over 20 years, and I’m happier and healthier for it. Most people do not think about these issues, and for that reason I support changing laws and policies to end some of the more horrific farming practices for the vast numbers of animals caught up in our food system, which also has the effect of raising consciousness on those issues. However, there is something perverse about deciding that farmed animals should be treated like a friend or a pet, and then betraying that trust by turning around and slicing the animal’s throat. I actually find such behavior more repulsive than the unthinking act of buying factory farmed meat from the supermarket. While the latter is responsible for much more suffering in the aggregate, the vast economies of scale and waste dictate that each purchasing decision does not directly correlate to the death of an animal, unlike the event being held at Suzie’s. Therefore, I cannot abide the sanctimony of the “humane meat” people who claim their actions are better than the rest of society’s. It is telling that the event describes killing and butchering with such euphemisms as “harvesting” and “processing.” Then the event page oddly proclaims “this event mirrors our philosophy behind the veggies that we grow here at Suzie’s Farm and our over-arching mission to educate, cultivate, and inspire. Please tell Suzie’s Farm: animals are not the same as veggies! Even a child knows this intuitively. If you give a child a carrot and a rabbit, it would be considered a sign of extreme mental disturbance if the kid were to pet the carrot and eat the rabbit.